Music and motoring: a combination as natural as bread and butter or pen and paper. These days it’s unthinkable to take a trip without listening to your personalised playlist. Precisely how we’ve brought that music to our ears has changed drastically over the years. Think back to your first car and you’ll remember the tangle of cables as you plugged your MP3 player in at one end whilst simultaneously charging it through the other, or fumbling through a stack of CDs to find the one you wanted to listen to. Hyundai Motor has a history of being associated with music, from sponsoring the Hyundai Music Park in Spain to this year’s Mercury Music Prize. With its New Generation i30, which features a range of smart connectivity features, the company reacts to modern customers’ needs. Now, the latest models boast Apple CarPlay and Android Auto, meaning car-buyers can bring their entire music library along for the drive. Venture even further back in time and you may even recall methodically compiling that all important mixtape for hours stuck in the car en route to a family seaside holiday, your parents fast-forwarding through all tracks that offended their more sensitive tastes. The technology seemed pretty clunky back then, and it was. But at least it existed. For the first four decades of the automobile, the only soundtrack on offer to drivers was the one provided by its engine, so it was no surprise when, in 1930, brothers Paul and Joseph Galvin of the Galvin Manufacturing Corporation sought to liven things up a little with the Motorola 5T71, the first commercially available in-car radio. At $130 it cost a small fortune – around $1,800 today. And this in an era when car ownership was a luxury in itself. If the Galvins’ radio sparked controversy about driving under the influence of music – it was considered as distracting then as texting at the wheel is today – the debate intensified when Chrysler launched the Highway Hi-Fi, a dash-mounted record player, in 1956. Nice idea, if rendered somewhat useless by the fact that the records jumped all over the place every time you hit a bump in the road. Thankfully technology – and common sense – has come on leaps and bounds since then. Here are the most relevant milestones in the history of modern in-car audio. Although the first factory-fitted radio appeared in 1933, for the next 20 years drivers had to make do with the low quality hiss of monophonic AM, the process of radio broadcasting that uses amplitude modulation. The first FM car radio was introduced in Germany in 1952, but despite this, AM continued to rule the airwaves until the 1960s. The much clearer stereo sound of FM heralded a big step up in audio quality, but it still left you at the mercy of whatever the DJ was playing. By the 1970s many car stereos featured a tape deck, giving birth to in-car audio’s greatest phenomenon: mixtapes. The eight-track player gave drivers control over the songs they listened to, and with a little bit of dedication and a lot of simultaneously pressing ‘play’ and ‘record’, the dream of hitting the road with your own individually compiled playlist was now a reality. While tapes enhanced audio quality, CDs took it to the next level. By the late 1980s, multiple-disc CD changers began to appear, enabling you to store up to 10 discs a time and switch between them whilst driving. However this came at a price, with drivers usually having to surrender some space in the boot, and still only a fraction of today’s endless cloud streaming. Pioneer debuted the world’s first aftermarket car CD player back in 1984, though for a long time only they were only available in premium automobiles. By the 1990s they had become commonplace across the market. Better yet was the ability to skip through tracks instantly, rather than rewinding or fast-forwarding endlessly until you found the right spot on a cassette, and when CD burners became a widespread feature of home computing, the mixtape went digital. Multiple-disc CD changers substantially increased the catalogue of music a driver could have it their disposal. But that was dwarfed when Apple launched its first iPod in 2001. All of sudden you could carry around thousands of tracks in one pocket-sized device, and capacity only grew with every new version. CD sales plummeted and cassettes disappeared virtually overnight. It took car manufacturers a few years to cotton on to this trend, but by the mid-2000s auxiliary inputs connected cars to iPod and MP3 players via a headphone jack, allowing drivers to choose from thousands of tracks. Nowadays the concept of having music on any kind of physical format is almost entirely alien. In the UK alone, a total of 26.8 billion songs were streamed on services such as Spotify last year, a rise of 82% according to trade association BPI. 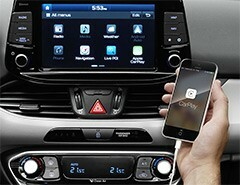 Given that the devices we’re all using to stream music are our smartphones, it’s only natural that manufacturers like Hyundai Motor are introducing Android Auto and Apple CarPlay on new models like the New Generation Hyundai i30, which leads the way by offering great value and connectivity. Users simply plug their phone in to bring up a range of all the apps you’ll need while driving on the car’s touchscreen. These can be controlled via the touchscreen and the vehicle’s buttons or – to ensure as little distraction as possible – via voice control. 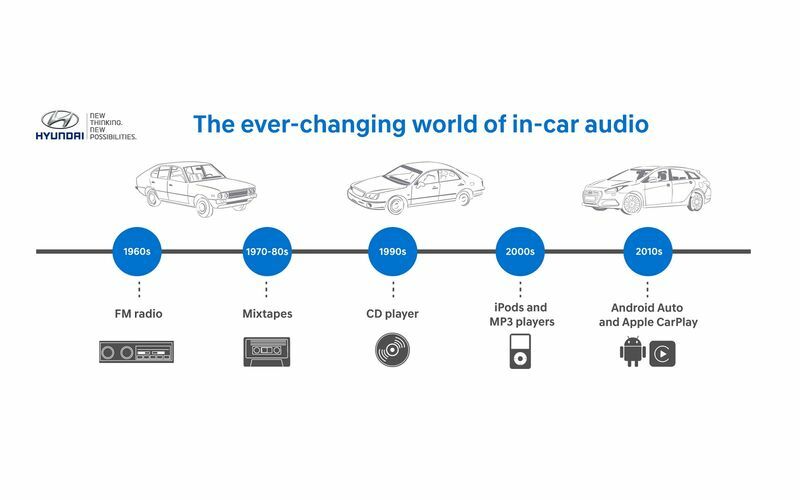 So there we have it, the history of in-car audio. The first wave of analogue technology brought clunky home devices such as tapes and CDs to the car, and the second wave of digital devices brought entire music collections with them. Today, the likes of Apple CarPlay and Android Auto seemlessly connect our digital life with our car.